I hope everyone has a wonderful Thanksgiving holiday! 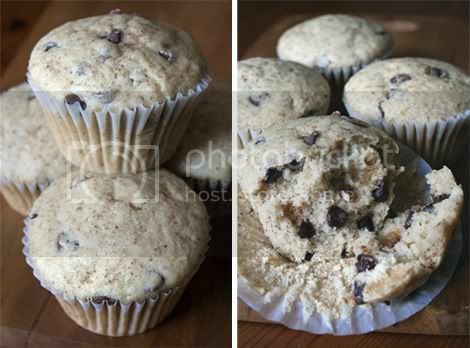 Before I sign off to begin my own holiday vacation, I wanted to leave you with the recipes for Mashed Sweet Potatoes and Chocolate Chip Muffins. The sweet potatoes are a vegan version of Martha Stewart's, and an excellent way to try something new with your traditional sweet potatoes this year. The muffins are so good, I've already made and devoured them three times! I veganized them from The Joy of Baking, and they would be perfect for a quick Turkey Day breakfast treat. Prepare the potatoes: Heat a stockpot filled with water over high heat; bring to a boil, then reduce to a gentle simmer. Place sweet potatoes in pot; boil until tender (a fork stuck into the center should go in very easily), 15 to 25 minutes. Drain, peel skins off and set aside in a medium bowl. Meanwhile: In a small saucepan, bring almond milk, Earth Balance, and brown sugar to a simmer, stirring to combine; remove from heat. 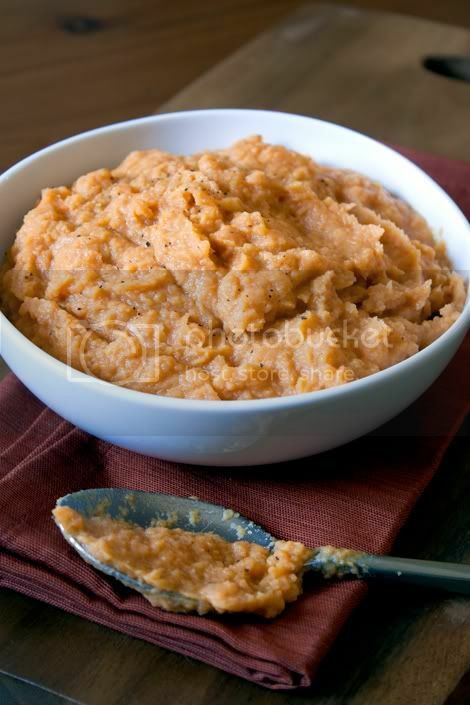 Add the mixture to drained sweet potatoes, and mash with a hand mixer on medium speed until smooth; season with salt and pepper to taste. To start: Preheat oven to 375° F . Line a muffin tin (regular or jumbo size) with paper liners. Prepare the batter: In a small bowl, beat the flax seeds and water until consistency similar to egg is reached. In a large measuring cup or bowl whisk together the flax mixture, almond milk, Earth Balance and vanilla extract. In another large bowl whisk together the flour, sugar, baking powder, and salt. Stir in the chocolate chips. With a rubber spatula fold the wet ingredients into the dry ingredients and stir only until the ingredients are combined. Do not over mix the batter or tough muffins will result. Makes 12 regular sized muffins. For jumbo muffins, cooking time will increase to about 30 minutes.